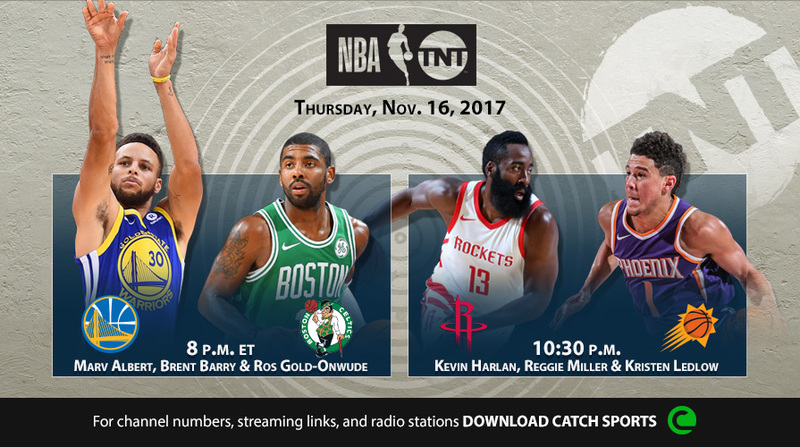 Thursday's NBA on TNT regular season doubleheader coverage will showcase a collection of the league's most explosive playmakers and dynamic scorers throughout the night, beginning with the defending NBA Champion Golden State Warriors and Stephen Curry visiting the Boston Celtics and Kyrie Irving in a blockbuster interconference match-up, Nov. 16 at 8 p.m. ET. The night's game action will continue with the Houston Rockets and James Harden vs. the Phoenix Suns and Devin Booker at 10:30 p.m.
• Throughout Thursday's TNT coverage, Kevin Garnett will be joined by current and former NBA and WNBA head coaches including Lionel Hollins, Mike Fratello, Brian Agler and others on Area 21. Select Area 21 segments will air during TNT's coverage, with additional content running on Facebook and Twitter. • In Thursday's opening game – Warriors vs. Celtics – interconference powers will meet at 8 p.m. ET, headlined by a match-up of points guards that went toe-to-toe in each of the three previous NBA Finals – Curry and Irving. • In Thursday's nightcap, the Rockets and Harden will visit the Suns and Booker at 10:30 p.m.